As much as I could deduce, the use case above is just a branding decision? Did you ever happen to provide this ligature in your fonts, or any other ligatures for Greek? If so, did you put it in liga, dlig, or elsewhere? I would appreciate native speakers' opinions on how this Ο_Υ ligature affects the logotype's impression. I suppose the Greek are rather well acquainted with it? But this is a different situation than with Latin f-ligatures, which are (or at least supposed to be) transparent to the average reader. Edit: I'm not sure if History of Typography is the right category choice for this topic, maybe Technique & Theory suits better. What I initially had in mind when I started writing was a bit different. What is curious is that you implemented this character like the Latin OU digraph — with a closed top. Can you give a reference? I was only able to spot the open-top variant in Greek type and lettering... Well, particularly only in the brand I showed in the OP, and maybe, just maybe, in some hand-painted signs, but I don't remember. 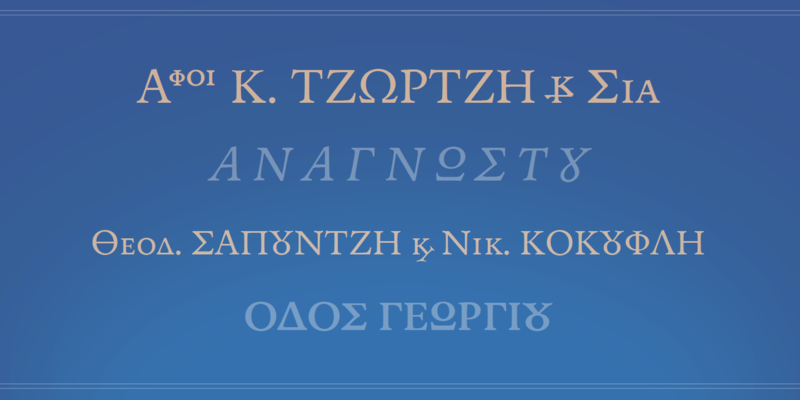 I’d be curious to see what the uppercase Omega in the font used for the word ‘Παπαδοπούλου’ in the above image looks like. I’d also be curious to know why Typedrawers doesn’t like lowercase pi Is my previous post mangled for everyone, or is it just Safari under macOS Mojave? Btw, the editor hosts an entirely separate <html> element — which has no access to the Alright's @font-face. The editor's content is then displayed in Lucida, even though its CSS is the same as for the posts. André: The ligature best fits into the Quinoa Titling style, where the Omega is highly stylized. The one on the right is the default Omega of the text style. Thanks, Christian. I was actually curious, though, about the one on the Chrispie's box where the Omicron_Upsilon ligature looks more like a rotated Omega than like the form you use in Quinoa with which I am more familiar. When I first saw this open-top Omicron_Upsilon, it just clicked as totally logical to me, because not only do the diagonal strokes resemble the arms of the uppercase Upsilon, but also the overall glyph resembles Latin U (or Latin Upsilon). Whereas the rounded closed-top form looks quite lowercase-ish. I have discovered this years ago and I love to include it in my fonts.